A note from Kenny: There didn’t seem to be a natural place to mention it, but I attended the MFA program at Kingston University – London from September 2014 – September 2015. Because I only finished the first year, I received an MA, rather than the full MFA. Most schools in the UK work that way – the MA is the first year, while the MFA is the second. What was it like living in London? How did you navigate the cost of living there? Lesson #1 about living in London: it’s expensive. There is absolutely no way around that fact, although I don’t think it’ll come as a surprise to very many people. Be prepared to budget, and also be ready for exorbitant prices on just about everything. But there are a few things most Americans won’t realize about London until they get there. For thing, if you’re on a student visa, you are legally not allowed to work more than 20 hrs/wk, so unless you’re independently wealthy, you will need student loans to support yourself. I had to take out $30k, and that was just for one year, and doesn’t include tuition. Of course, it’s possible to live on less—but that gives you an idea of cost of living. Another major shock will likely be living accommodations. UK bedrooms are much, much smaller than ours. They’re broom closets with delusions of grandeur, and some of those 6’x8′ boxes can run you $400-900 a month, depending on what part of London you’re in. Not the apartment – just the bedroom. Now, this makes it sound like I hated London, and although I’m typically not a city person, that couldn’t be further from the truth. While expensive, London has a lot to offer. I was miserable for my first few months—hated my program, hadn’t made any friends, didn’t have much money, etc. So I joined a social club and was going to about four events a week, from treasure hunts and murder mystery dinners to pub quizzes and escape rooms. I can honestly say that I’ve never had so much fun in my life, and I miss it every day. It was really interesting to listen to conversations regarding all sorts of things, like politics and world events, as the British have a totally different perspective than us. Also, for any history buffs out there… it’s London. Need I say more? One thing writing students should know about the UK is that their academics are different from ours. Staff hierarchies can be very confusing, instructors have different expectations of academic papers than US instructors, and degree programs tend to be shorter. In the US, you’d go for an MA or an MFA; in the UK, the first year of a post-grad creative writing program is typically for an MA, but students can choose to continue for a second year to get their MFA. The second year will usually involve pedagogy classes and some form of teaching experience. There’s also the language: pants = underwear, trousers = pants, suspenders = ladies’ undergarments, etc. The first short story I turned in was entirely about a diplomat losing his pants, and the whole class was confused as to why he didn’t just put his trousers on. We may all speak “English,” but that doesn’t mean we’re speaking the same language! Learn the local lingo, otherwise you’ll be rather lost when a classmate tells you that your outfit is completely naff. I didn’t notice any real difference between workshops in the UK versus the US, but part of the reason I declined the second year of the program (which would have given me the MFA instead of the MA), was the fact that the staff seemed to push the concept of students helping each other to the point where nothing was expected of them. We got little to no feedback on our writing projects from our instructors, in or out of workshop. Of course, we were welcome to make appointments, which consisted of 20 minute blocks, but since they weren’t required to read the piece we wished to discuss ahead of time, 10 of those 20 minutes were spent awkwardly sitting across the instructor’s desk, waiting for them to read your piece. To get back on topic, a majority of students on the program were part-time students who had absolutely no background in writing; they had never taken any classes or published anything at all. While many of these students were perfectly pleasant and intelligent people, their feedback was far too basic to be useful, like that you’d get from your mother: “Oh, I just loved that bit about the beach ball! It was so funny.” I’ll just say that I didn’t find the workshops to be particularly helpful. What was your MFA experience like outside of the classroom? There were plenty of out-of-class events, mostly in the form of weekly readings by guest authors, and Kingston does have a literary review (RiPPLE), which I proofread for. That being said, I feel that I should mention that the reason I chose Kingston was that they claimed to be a haven for students wanting to write popular/genre fiction, so the complete lack of events, classes, and instructors familiar with that type of writing was a major punch to the gut. After a month or so, I stopped attending most of the school-sponsored events, because I felt out-of-place. I want to make it absolutely clear that this is all one man’s experience with one school—I know several people who studied at other UK schools with great success, so please keep in mind that this review isn’t representative of all UK schools. Why are you pursuing a low-res MFA after completing your MA? I had intended to earn my MFA at Kingston, get a work visa, and stay in the UK. After my frankly abysmal experience, however, I declined my second year, denying me the terminal degree in the field, and instead granting me a mere MA. While there’s nothing inherently wrong with an MA, the simple truth is that, when it comes to jobs in academia, most of your competition will automatically trump you with an MFA. For a while, I resigned myself to the fact that I’d simply have to publish several successful novels in order to be taken seriously as a would-be college professor, and I dismissed the idea of returning to school. Putting more time, effort, and money into a program that may turn out to be just as disappointing as Kingston wasn’t a pleasant prospect. Eventually, though, with a bit of prodding from friends and family, I determined that I really did want that MFA. At first, I didn’t even consider low-res programs. I wanted a traditional program with regular classes and physical interactions with my teachers and classmates. But as I looked through the pages of Poets & Writers, and scanned Princeton Review, and even scoured Google, I wasn’t finding anything that fit the bill. Not wanting a repeat of Kingston, I needed heavy assurances that I would have students and classmates both knowledgeable and passionate about popular fiction. I didn’t want to be forced through more excruciating months studying sonnets and getting feedback from people who specialize in experimental poetry. So I expanded my search, and my continued efforts yielded a result—Seton Hill University’s MFA in Writing Popular Fiction. Normally, you’d choose to specialize in fiction, non-fiction, poetry, or screenwriting. At Seton Hill, you specialize in horror, young adult, mystery, sci-fi, romance, or fantasy. This alone got my blood pumping, but they take things even further by requiring every student to finish a complete novel by graduation. No arbitrary word count requirements here—this program is for people who want to be novelists, so they make you write a novel. Go figure. I haven’t started my studies with Seton Hill, yet, but I have high hopes. I can tell just from the course descriptions that I’ll be getting an education much more tailored to my personal writing style. If there’s one piece of advice I would give to would-be writing students, be they undergrads or post-grads, it’s this: find out what any given program specializes in. Sure, they may offer fiction classes, but if their staff consists of 15 poets and 2 fiction writers, you may want to look elsewhere. I’m the perfect example—I went through a fledgling BFA program at a small school who hadn’t yet acquired any fiction writers. Then I went to an MFA program that had a grand total of one instructor with any knowledge in my field. Don’t take the fluff on the program’s page at face value – do your research, look into who’s teaching, and find the program that fits you. Kenny was born and raised in Southern-ish California. 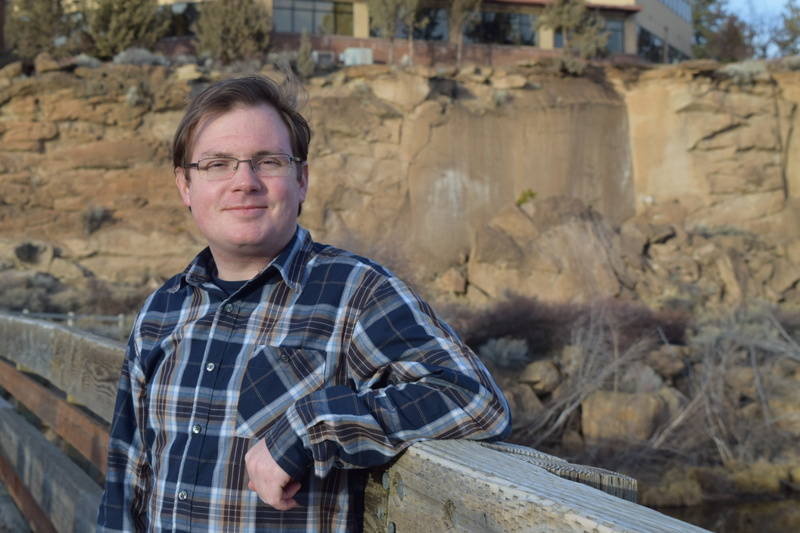 After six years serving as an Intelligence Analyst in the U.S. Navy, he decided to focus on something he enjoyed, earning a BFA in Creative Writing at Sierra Nevada College, and an MA in the same at Kingston University – London. He is currently enrolled in Seton Hill University’s low-res MFA in Writing Popular Fiction, where he hopes to finish the series of fantasy novels he’s successfully procrastinated on for years.